Subchondral sclerosis is one of the hallmark findings of osteoarthritis (OA) and has long been discussed as one of its causes. Indeed, the changes in the subchondral bone often precede cartilage destruction in the development of the disease. 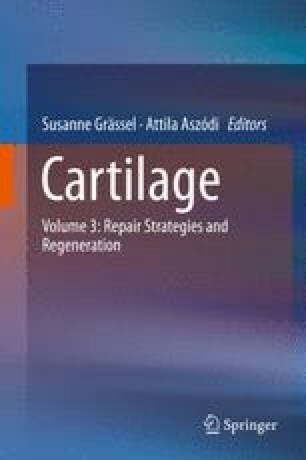 Integration of the so far published data including in vitro, in vivo, and mathematical work suggests a critical role for this tissue in nutrition and oxygen supply to the articular cartilage, which may become even more critical in energy demanding processes of healing and regeneration. Indeed, the success of current predictive diagnostics like specialized MRI techniques and scintigraphy as well as successful regenerative clinical therapies like microfracturing, AMIC, or NAMIC can be better explained if the subchondral bone is taken into the account as supply route for the cartilage. Consequently, subchondral bone has to be included into the diagnostic and therapeutic concepts aiming to regenerate lost or damaged cartilage for advanced diagnosis and treatment of OA. AFS wants to thank Dr. Wolfgang Schilling for critical discussion. This work is in part supported by a grant of the German research foundation to AFS (FOR 2407; Schi 857/9-1).